The MP for Beaconsfield told talkRADIO’s Julia Hartley-Brewer: “The Government will not survive a no-deal chaotic Brexit. It is very very simple. “It is not a question of wanting to bring the Government down. I have no desire to bring the Government down. He added: “The political parties that don’t deliver benefits to their supporters and the wider public – who aren’t seen to be acting in the public interest – have no business surviving. Placard oppposite the Houses of Parliament calling for a second referendum on the final Brexit deal. 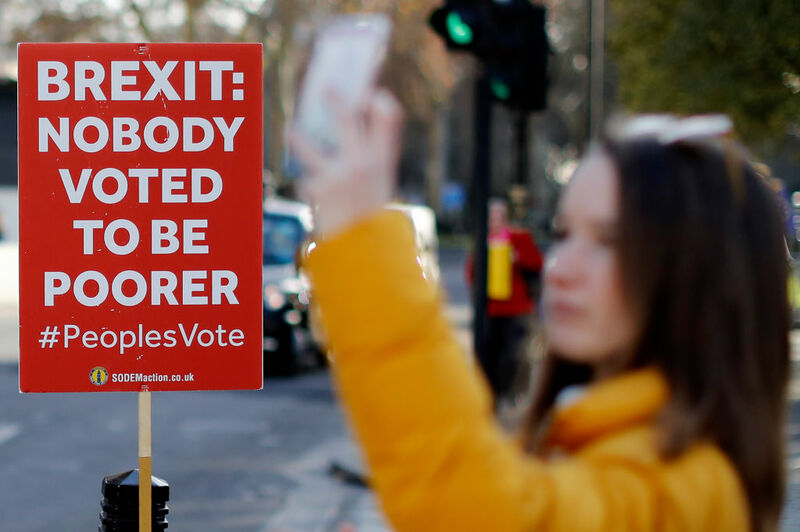 Grieve added that a no-deal Brexit would have “massive consequences” for UK trade, and called for a People’s Vote to allow people to decide “what they want”. “A no-deal Brexit will cause chaos. If my colleagues are serious about departing from the EU without any trade deal that will have massive consequences to our trade and our business,” he said. He added: “The deal is a bad deal but the alternative is even worse. The only terms which we are likely to leave the EU are the terms that the Prime Minister has negotiated. “If people want to leave the EU on those terms then so be it, as a democrat I will have to accept it. “But my view is that it has got to be put back to the public because what we are discussing now was not what we were discussing at the time of the referendum in 2016. “We have got to get realistic about this, if people feel that leaving the EU is so important for them, well then we will leave on terms that will do us severe economic damage.